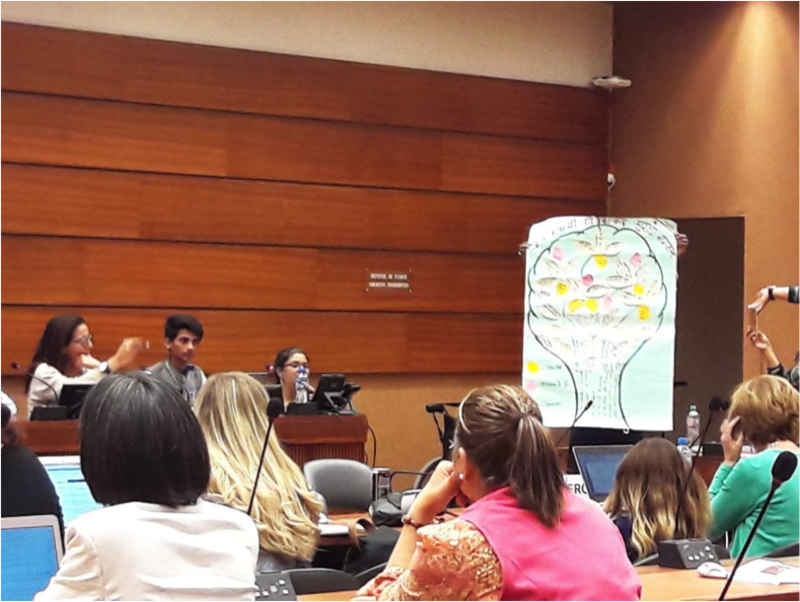 Day of General Discussion (DGD) 2018, organised by Child Rights Connect, gathers each year, associations, NGO’s, and of course children, present to speak, and defend their rights. 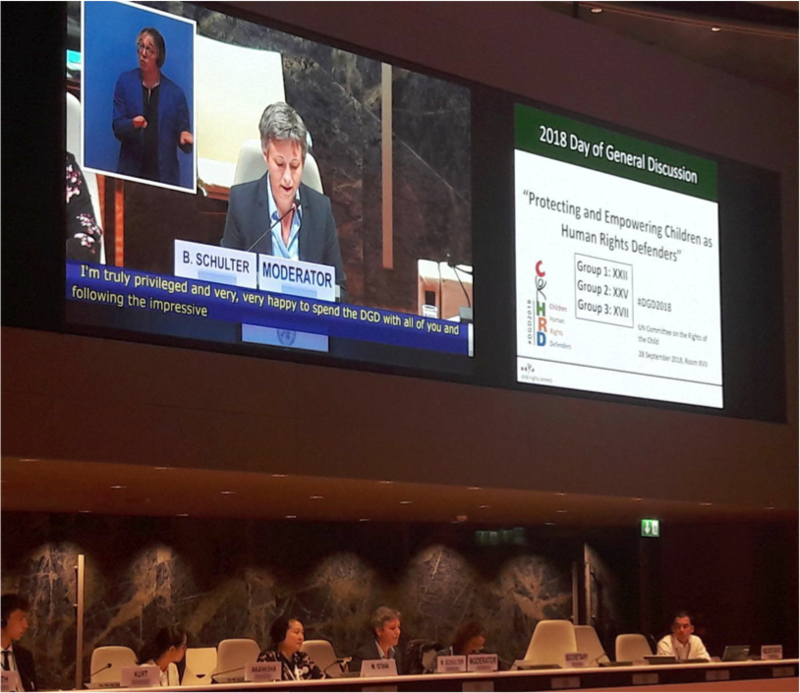 The Committee on the Rights of the Child is held every 2 years, a DGD focused on a specific article of the Convention on the Rights of the Child. Today, it was about article 12: the right to have an opinion, to express it, to be listened and to express it without fear. The two keywords of today’s general discussion: Empowerment of Children and Protection of Children. In a digital environment, being young is a competence, and young age should not be a barrier to the protection of rights. Furthermore, prevention is as important as protection, to prevent threats before they appear. Also, this day is an opportunity for children to get involved in the whole process of discussion with Child Rights Committee and NGO’s. “Many children in South America are suffering from their rights being violated. We are all Human Rights Defenders since we were born. In Argentina, we suffer from our rights being violated. We are the present not only the future. ». « If the world could be seen through the eye of a child, lots of problems about child rights would have been solved or would have not existed” said, Kurt a 16 years old child from Argentina. After this introduction, began debates with working groups, split into 3 child rights defenders categories : Online platforms, State Actors and Non-State actors. And for each of them, children and NGO’s were invited to speak upon severals topics related to the DGD subject “Empowering Children as Human Right Defenders”. The Online platform group was divided into 6 subjects : Civil society space for CHRDs (Children Human Rights Defenders) , Empowerment through digital media, Child-led initiatives and protection online, Empowerment and protection of CHRDs victims of sexual exploitation, Indigenous CHRDs, CHRDs with disabilities. All of these themes, invited children to talk about their experience as a Human Rights Defender in their country. For example, we could hear the voice of Tomomasa, a Japanese youth former representative from a student group association related to social media prevention. He helps children to be aware of Internet addiction. He explained how internet could become a danger giving them instructions. Later on, Magdalena, 12 y.o., from Moldova, explained what Lumos activities are and which challenges and opportunities she faced as a disabled child. Lumos is an organisation founded by the famous Harry Potter saga author, J.K.Rowling, and promotes an integrated policy and programme of deinstitutionalisation and inclusive education for children with disabilities..
«Every child has the right to be protected and to be loved, and even these child with disabilities, and this is the mission of Lumos. […] I have a suggestion for the next Day of General Discussion, i hope we will more talk about how promoting children rights for those with disabilities». At Humanium, we strive to uphold the rights of every child in the world, by sensitising adults and children about our cause, by changing attitudes, and by working directly in the field. Visit our website https://www.humanium.org/en/ to learn more about children’s rights and our work, to contact Humanium’s team, and to stand beside us in improving the life of thousands of children throughout the world !